I could have skipped the trip to Versailles and came here. The crystal-infused flamboyant design is something to behold. Ultra high-end contemporary luxury reaches its American zenith with this storybook destination from the fabled 250-year old French glass company. Service is top-notch and the decor is fit for a king. Baccarat crystal chandeliers sparkle as they chime overhead and exquisite stemware overflows with champagne in the lounges, all of it creating rich pleasures for the senses. Lavishly ornate artisan woodwork, sculptures, white marble, custom moldings and rich details are in all the rooms and suites, creating simply grandiose interiors. The in-house restaurant and bar are not only lively but most importantly, it attains high marks for food and drink. Service is refined and enthusiastically engaging, managing to confidently keep aloft the flamboyant perception of extraordinary luxury befitting royalty. The cellar swimming pool, lined with a wall of most comfortable cabanas, is subdued but nifty in design. 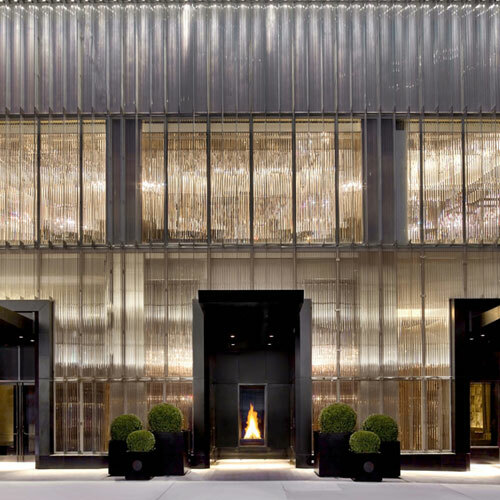 It will come as no surprise if the deep-pocketed and well-traveled might view the minimalism and restraint of other contemporary hotels as being passé after an opulent stay at the Baccarat. Smoke free premises. 114 units, some two bedrooms and condominiums. 50 stories, interior corridors. Accessibility (Call). Between 5th and 6th aves. 28 W 53rd St 10019. Station: 5 Av. refrigerators, coffeemakers, pay movies, wireless Internet, safes. Some: high-speed Internet. hot tub, steamroom, cabanas, recreation programs in season, health club, spa. valet laundry, room service, child care, area transportation-within 15 blks.